Just wanted to do a quick post on how easy it is to move an existing Synology disk group to a different Synology device. I recently had to do that but the information available wasn’t too clear, especially with regards to the safety of existing data etc. It started a few months ago when my Synology 1515+ started shutting down intermittently, despite being on a perfectly-functioning UPS. Life was such those days that I couldn’t investigate it at all and after a month’s worth of such shutdowns, it died permanently. A week or so ago, I had a look to isolate the issue. After eliminating added RAM, hard disks, power, cable etc. as issues, it was clear that power supply was the culprit. If you don’t know already, Synology 1515+ or similar class of devices, have a 3-year warranty so I contacted Synology support. Taking a moment to mention how brilliant they were! Despite the fact that they were in a process of moving their offices/warehouse (thankfully, just half-an-hour away from me! ), their responses were very quick. It also helps that I had already pretty much eliminated all other causes and due to proximity, I was able to deliver the device to them myself but RMAs are usually much more tedious and time-consuming. In about a weeks’ time, the whole RMA process was complete and a replacement device delivered to me. I have three drives in the device and it’s always important to note their slot number when taking them out (to get the device replaced). Unfortunately, if your device dies suddenly, you don’t get a chance to note the DSM version. However, I knew that it was at least DSM 6.1. If you ever have to do this, I hope you’ll have at least DSM 5.x as older version might be slightly more difficult to recover. Synology does provide an article that explains the process to do that but the process assumes that your old device is still available and functioning and requires an additional spare hard disk to be available. In my case, both were not true. That’s why I thought this quick post can help. Fortunately, the process is surprisingly simple. If you noted the correct order of disks when taking them out, it’s as simple as placing them in exactly the same order in the new device, connecting it to the network and powering it up. 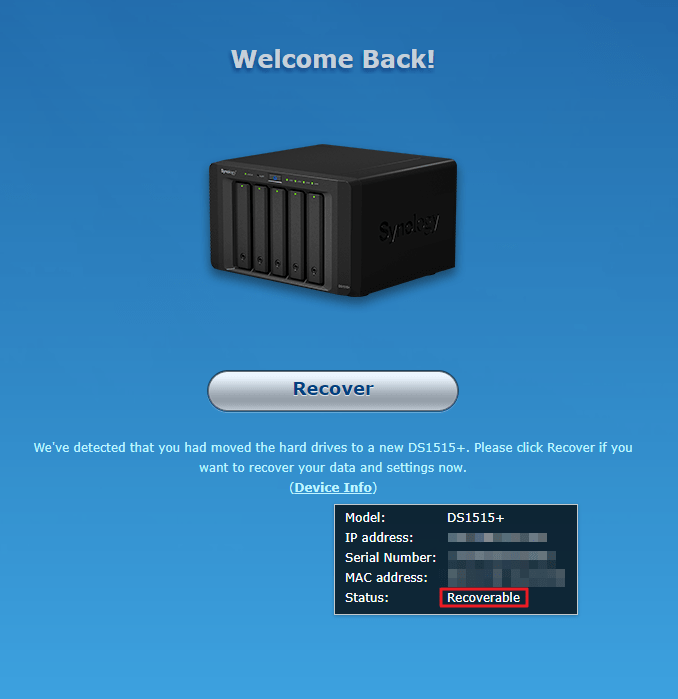 Once booted up, go to http://diskstation:5000 and it automatically detects that the drives are coming up in a new environment and offers to “Recover” and if you hover above “Device Info”, it shows you the status as “Recoverable”. Please note: DO NOT continue if you’re told something along the lines of “All data on the hard drive(s) will be deleted” as that would mean you’ve made a mistake with the order in which you’ve placed them. Power off the Synology and try all the placement permutations until you get it right. Of course, the set might genuinely be corrupted but I am assuming it was good when you started. You can guess which button to click here. It takes some time but once complete, the device restarts. Here’s the good part: I wasn’t expecting the recovered set to retain all the configuration information but it did. Once up, the device was available on its original IP address with the same username/password combination and with all the applications intact too, as if nothing happened. Of course, there was a DSM update to be done but apart from that, everything was as it was before the failure. I was expecting that kind of information to be stored just on the device but it must be on the disks too as the device was completely new. In my case, it was great as I didn’t have to do any post-replacement configuration but it also means that your data is completely exposed if someone gets hold of your disks. That said, if you fail at securing your devices physically, you’re hacked anyway! Hope this alleviates any concerns when having to replace your Synology device with another one in case of a replacement. Do you know if this would work across different Synology models as well, or is it limited to when you are replacing with an exact same model housing? Apologies that I couldn’t reply sooner. Not having tested it, I can only assume that it will, if you’re running DSM 5 or above and follow the tips I mentioned in the blog. Don’t proceed if the disks don’t get detected etc. That said, the authoritative opinion will only be from Synology. Support is pretty good so maybe you could confirm with them?? Thanks for the info. my 1515+ production NAS went down today. and RMA is a week times. Have to buy a new one right away. going to buy the same model. but good to know if DSM 5 or greater your guiding steps work. I may get a 1517+.